Tommy Bahama Bar and Store on Oahu Hits the Mark! Tommy Bahama has done it again! The high-end, island-inspired mega-brand, known for everything from Aloha shirts to fragrances, has just opened Oahu’s first Tommy Bahama Bar and Store in Waikiki’s Beachwalk. And, I had the privilege of being one of the first to sample the restaurant’s high-quality food. The venue is actually three-stories high, with a central staircase that transcends bottom-to-top. The Tommy Bahama store is located on the bottom level, with the restaurant occupying the second floor, and a rooftop lounge on the top level for private parties and happy-hour. And, in the restaurant, guests are treated to a 14-foot tall living wall that’s equally interesting and impressive. In total, the space occupies 19,200 square feet! The architecture echoes the vibe—cool and airy. And, whoever designed the venue mastered the art of tradewind cross-flow. You felt cool and refreshed, even on this hot day. Although I could have spend the better part of a day shopping and ogling the décor, I decided I’d better get to eating, especially since my wife, Yaling, had come with me! When we were seated, we were offered a prix fix menu (pre-selected menu items at a fixed price), and we decided to give it a whirl. Our dining experience began with an hors d’oeuvre of raw Opakapaka with crispy Canadian bacon. I noticed a pastrami-type flavor throughout that really added to the dish, and overall, it was the perfect way to start out the meal. 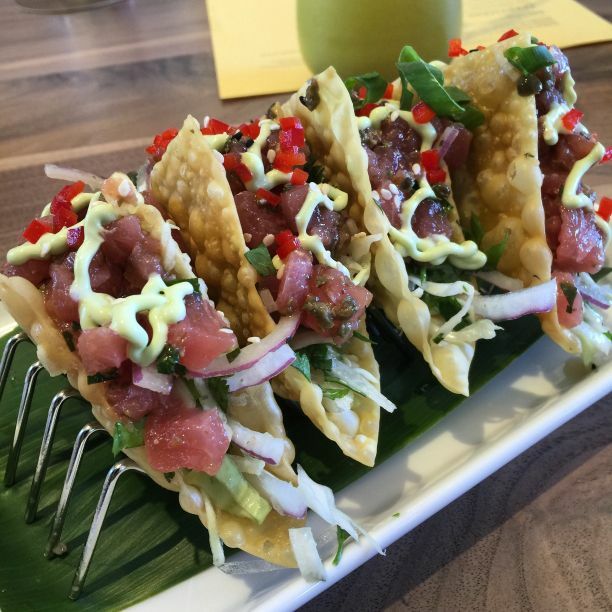 From there, we dined on an appetizer of crispy Ahi Tuna Tacos that were some of the freshest and most delicious items I’ve ever eaten. The dish came in a wonton sell with Asian slaw and wasabi creme, and it was, in a word, delicious. 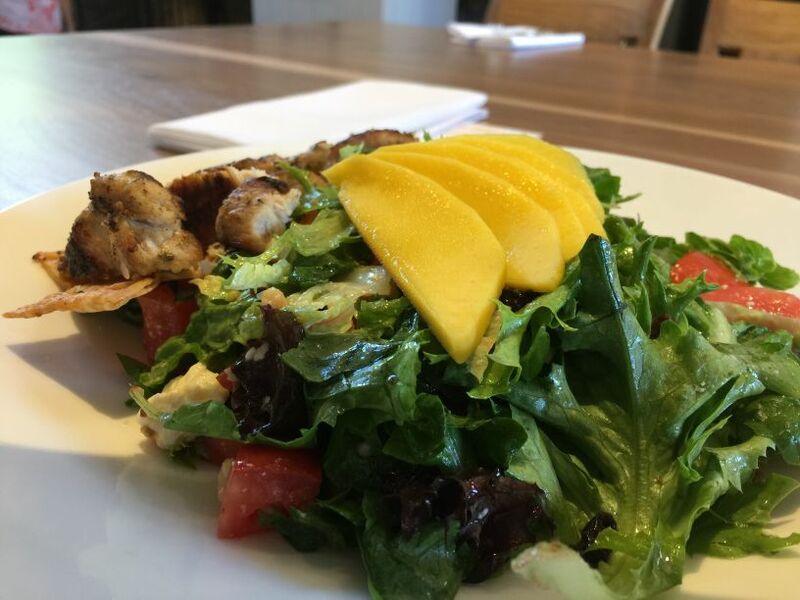 Yaling opted for the Grilled Chicken and Mango Salad entrée, and she was thrilled with her choice. The item comes with toasted almonds and macadamia nuts, feta, dried blueberries, pepitas, vine-ripe tomatoes, and a Meyer lemon vinaigrette. On a day that was hot and humid, she couldn’t have picked a better dish, as she described it as delicious, refreshing, and fresh. 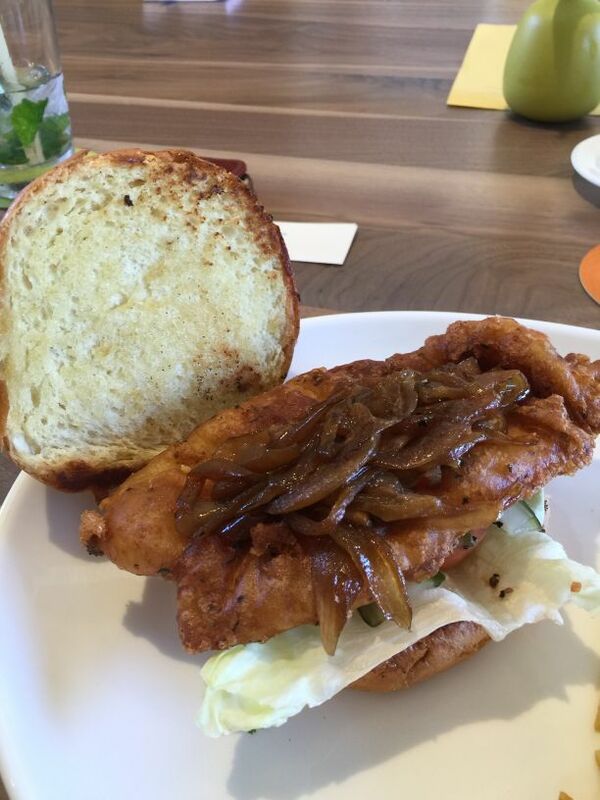 I, on the other hand, ordered the Crispy Fish Sandwich with beer batter, honey roasted onions, island tartar, and fries. The fish was the star of the dish, and it’s no suprise why. 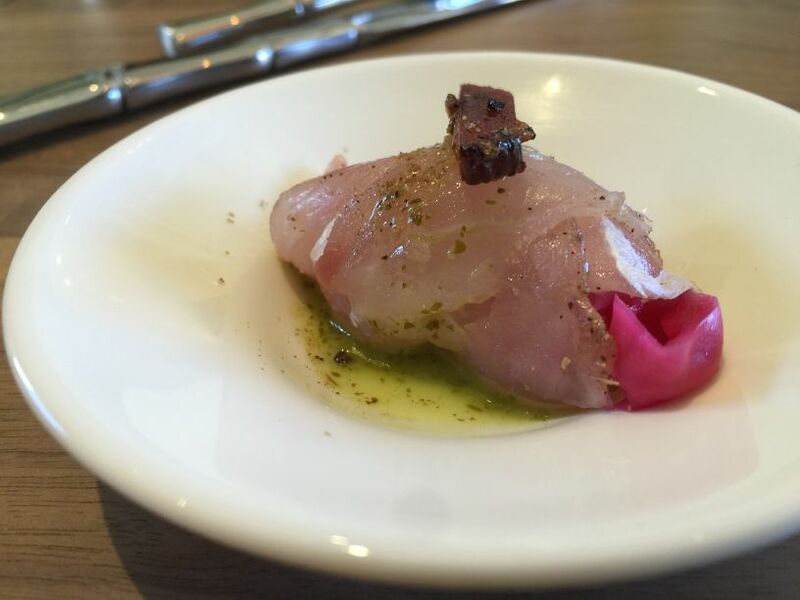 Fresh fish is a Tommy Bahama signature, and our expectations were certainly met. In fact, the restaurant prides itself on hitting the fish markets early, so diners can eat the freshest fish possible. For dessert, we ordered the Key Lime Pie with a graham cracker crust and white chocolate mousse. We couldn’t believe the sweetness! We suspect those Key Limes came straight from Key West because the pie was the perfect scion of sweet and sour—bravo! To round-out our meal, we were treated to a nice surprise when Chef Andrew Warner came out to greet us. Gracious and knowledgeable, Chef Warner impressed us with his friendly demeanor and professional demeanor. Seems Tommy Bahama made a stellar choice when bringing Chef Warner on board. And, I would be remiss if I didn’t give props to the amazing wait-staff. They were courteous and knew all the intricate details of every dish. It’s just the type of service you would expect from a brand like Tommy Bahama. Tommy Bahama Bar and Store provided just the right lunch-break I was hoping for. The entire atmosphere was light and fresh, just like the food. And, eating there is a welcome reminder why island living is for me!